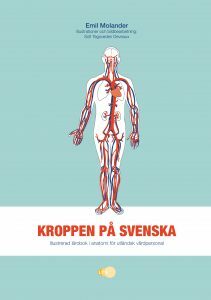 A brand new book of Medical Swedish for foreign doctors, nurses fysiotherapists and others who need to learn the Swedish names for body parts and internal organs. Works perfect as a beginner's first Medical Swedish book, but also for those who already know some Swedish but need to improve their anatomical terminology in Swedish. Learn 350 nouns for body parts, organs and diseases in Swedish. Listen to audio files to practice the pronunciation of all the words. Learn the Swedish vocabulary for diseases and pain. Test yourself with detailed blind maps. Learn the Swedish practice of spelling of medical terms in Greek and Latin. Visit the book's website to find keys, audio and teacher support. Kroppen på svenska – Illustrerad lärobok i svenska för utländsk vårdpersonal was written by Emil Molander, and was illustrated and designed by Sofi Tegsveden Deveaux. You'll get the best deal here below, but Kroppen på svenska is also available with the major online book shops, like Bokus. This book series is called Yrkessvenska inför praktiken and includes three to four jobs in each book. The first book was published in June of 2017 and is called Yrkessvenska inför praktiken – lokalvård, hemtjänst och kök (cleaning, home care and kitchen) Scroll down to order your copy. All the texts have been recorded and can be listened to at the book's website, where you'll also find keys. No login is necessary. The second book of the series is called Yrkessvenska inför praktiken – bygg, fastighet, lager och transport (construction, janitor work, warehouse and transport) and was published in August of 2017. Read more on the publisher's website , or visit the Yrkessvenska blog where I have written a bit about how the books came to be (in Swedish). Click one of the pictures to order the books from Bokus.